Tell us a bit about where you’re from and how you ended up in museum work. Deborah King: San Antonio, Texas, is my hometown. I studied anthropology at the University of Texas at San Antonio, and enjoyed the field work and archaeological collections process. I moved to New Mexico in 1985 and continued my work with the National Park Service, helping with collections for 37 different parks and monuments in the Southwest. Yasmin Hilloowala: I ended up in museum work because I got a part-time job in the collections department at the Arizona Historical Society while I was in graduate school at the University of Arizona. One of the first tasks I did was to catalog a set of Christmas ornaments. I knew from then on that I wanted to work in museums. 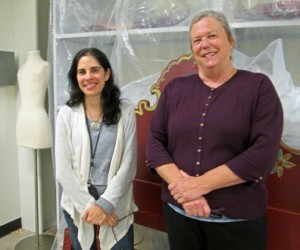 What made a job at the History Museum enticing? Deborah: I have always been passionate about historic structures, so the opportunity to work at the Palace of the Governors is very attractive. Having worked with the collections before, I am aware of the great significance and historic relevance these objects hold. Yasmin: Most of my career has been spent in history museums. They are the most interesting because they have such a variety of collections. What are some of the challenges of our collections? Deborah: The biggest challenge is preserving the Palace of the Governors. The building is subjected to the very things we protect against in the climate-controlled environment of collection storage—temperature, humidity, light levels, bugs, rodents and handling. It takes a dedicated team working together to maintain its integrity. Yasmin: The variety of artifacts makes housing and caring for the collections challenging. What’s your favorite artifact so far? Deborah: The Palace of the Governors. Yasmin: A lusterware charger on display in the Palace because it is related to my academic field, which is Middle Eastern art and history. What do you collect for your own home? Deborah: I create and collect memories. The repository of these intangible memoirs will be with my children with no space requirements. Yasmin: I don’t collect anything. Managing a collection cures you of wanting your own collection. While prepping for an August talk, Photo Curator Daniel Kosharek and Imaging Specialist Hannah Abelbeck reached into a box and pulled out a mystery. 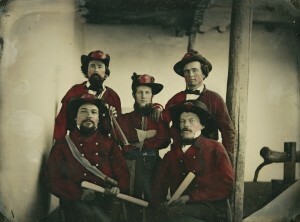 It was a poorly documented ambrotype of a group of five men whose jackets had been painted bright red. Background details included a viga and corbel, hinting at a New Mexico provenance. Was it from one of the Civil War campaigns that occurred in New Mexico? Mark MacKenzie, director of the Museum of New Mexico’s Conservation Lab, provided the first clues by working on the photo’s sorry condition. Abelbeck then scanned it at a high resolution, revealing even more. She searched for information about red uniforms of the era, but found nothing. When she magnified the image, the men’s hats revealed intriguing symbols: a star, a cannon and a bucket. When she flipped the mirror image, what had seemed like Southwestern hieroglyphics turned into letters: “FFC.” Could we be looking at a fire company? The men had an air of official business about them. One held a gavel; he and another had rolled-up documents. We posted the image on our Facebook page and sent a query to the Historical Society of New Mexico. Soon, interested folks were weighing in with their ideas. 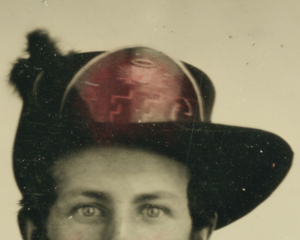 Everyone slowly closed in on the idea of this being the early Santa Fe Fire Company, and a call to the modern-day version yielded a hopeful response. Assistant Chief Jan Snyder said the photo looked very similar to one in the department’s mini-museum off Cerrillos Road and could depict a bucket brigade. The Territorial Legislature created the Santa Fe Fire Company on Jan. 26, 1861. 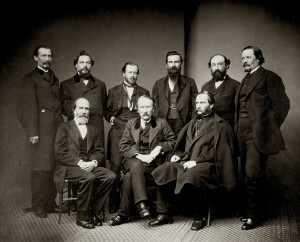 A photographer might well have captured an inaugural image, and ambrotypes were a popular medium between 1850–1865. Abelbeck kept at it and soon spotted a similarity between the man seated on the left and one of the men in a famous portrait (left, Palace of the Governors Photo Archives 009826) of Civil War-era figures, including Kit Carson, seated in the middle. Charles P. Clever was a German immigrant and an influential businessman and trader, a mason, and the U.S. Marshal for New Mexico starting in 1857. Using Clever’s name, Abelbeck dug up the text for the fire company’s Act of Incorporation and a list of its initial participants. She’s still working to match the other four men and thinks one may be Solomon Spiegelberg; the other seated fellow may be Charles Emil Wensche. Have a hint? Send it to Hannah.abelbeck@state.nm.us. The more one sees of the world…the more he respects Fred Harvey. He is the Great American Caterer. Will Rogers noted that Fred Harvey “kept the West in food—and wives.” But the company’s Harvey Girls are by no means its only legacy. 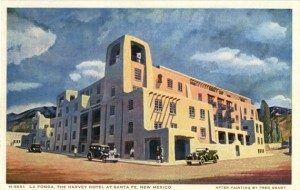 From the Atchison, Topeka and Santa Fe Railway’s 1879 arrival in New Mexico to the 1970 demolition of Albuquerque’s Alvarado Hotel, the Fred Harvey name and its company’s influence have been felt across New Mexico, not to mention the American West. The company and its New Mexico establishments served as the stage on which people such as Mary Colter fashioned an “authentic” tourist experience through architecture and interior design, while Herman Schweizer helped drive the direction of Native American arts as an industry.